The dolls have cute toddler like expressions, and gorgeous bodies - and of course they can stand up as their bodies are totally vinyl. Marieta is 36cm/ 14.2" tall. Her black hair is sewn into her head and her brown eyes are acrylic with a realistic patina. Her hair is short, with 2 long plaits either side of her head. Her vinyl is brown. She has joints at the shoulders and hips so that she can stand and be positioned for activity. 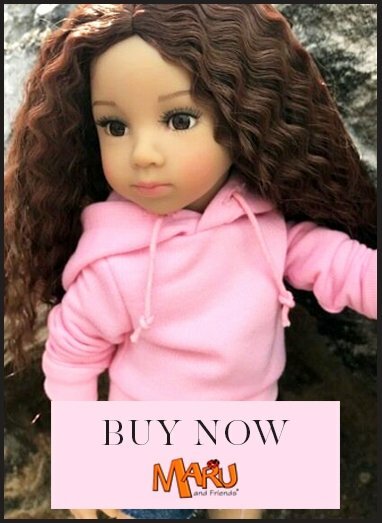 Marieta dolls are safety tested for children from age 3 and My Doll Best Friend recommends her to girls of this age upwards as her body is similar to that of young children. However, we know that these dolls are appealing to grown ups too!